Mindy's fitness Journey: Praying for Boston and runners everywhere... and God Bless Americans! 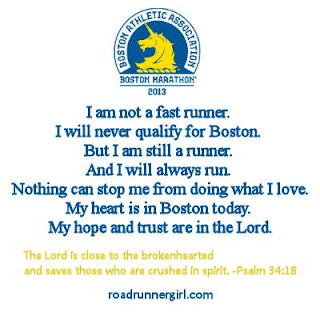 Praying for Boston and runners everywhere... and God Bless Americans! We were going to run but Bryce suggested we walk and talk! Praying for Boston... That's all I seem to be able to do! This year is the first time I have felt connected to the running community, and it's the first time that I have had people I know running in Boston on Marathon Monday. Every time I had a break at school on Monday, I peeked at facebook to see pictures or hear updates on how people were doing. I was so excited to read tweets and posts about the excitement. Little did I know that later in the day I would searching for tweets that they were safe. 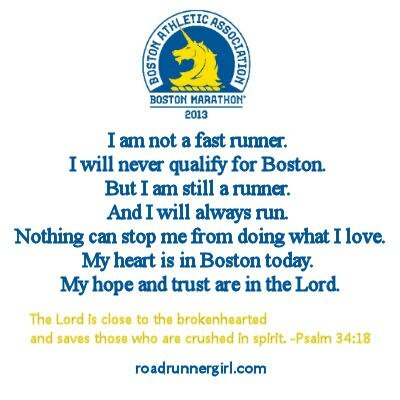 I am a runner, but I am not a Boston runner. I probably never will be. I am slow, and I don't know that I will ever run a marathon, but I do know that Boston is the Super Bowl of running. It's the race runners dream of. They train and train and train to get there! And now many won't finish and many are dealing with injuries and death. I was in the car on the way home from school when I got a text from my mom to put it on Fox News because a bomb went off at the finish line in Boston. God, just typing that brings tears to my eyes again. I ran through the front door and turned the TV on. I immediately opened my laptop to read my Fitfluential, SweatPink, Polar and GirlsGoneSporty group pages. I needed to know that my friends were safe. Once I saw the news, I realized that it was the crowd that would be more affected than the runners with injuries. I thought of my son standing at the finish line of my 10K holding a "Go Mom" sign. I couldn't breathe. Since then, I have done everything I can to be with my son. I have closed the computer and walked and talked and played. I think of the man whose son died, daughter lost her leg, and wife is in serious condition, and I can't help but to hug and kiss my son and tell him I love him. The one thing I know is that this community of runners, and if you run/jog/walk fast, you are in it, this community is strong! They are kind and friendly and helpful. But let me tell you something, YOU don't mess with this group. We have each others' backs. You will NOT stop us, rather we will run more, harder and faster! My heart is heavy, and this hurts badly! But I will run every race I planned to and maybe even some more now. Being a runner comes with a similar pride to being an american. I am so proud to be an American and so proud to see how everyone helped yesterday. Seeing people rip off their shirts to help people was tragic yet inspiring. I would hope I would be the kind of person that would do that without thinking. God Bless Boston, Runners and Americans! To my friends who are affected personally by this, I am praying for you. I am thinking of you! I love being a part of this community and feel so blessed that I was welcomed in with open arms! God Bless! On a lighter note, I have giveaway winners!!! I didn't announce them last night bc I didn't want to celebrate anything. But tonight, we do have something to celebrate! All of the winners have been notified via email and have 48 to claim their winnings. I am announcing 3 new winners for the StickitStrong giveaway bc no one claimed them. Congrats to Shannon W. Cassie C. and Laurel C. The Dumbell necklace winner is Amy N. and the Foundation Nutrition winner is Melissa M.
Last chance for the Allied Medal Display! 2 Hours left... ends tonight at midnight! I love the Think Strong Be Strong Finish Strong display. It seems so appropriate in so many ways right now. Crossing a finish line isn't the only way to finish strong. Awesome words Mindy! I feel like I have been looking at my hubby and boys in a different light. I'm so thankful and blessed. You never know when your world can be turned upside down. Being a runner this tragedy hit home. Praying for Boston! I may not be a runner, but all of you ladies have changed my life and I feel a connection with all of you too!!! I am blessed to know you and this whole event has made me look at so many things differently. Love you lady and so happy I met you!!! 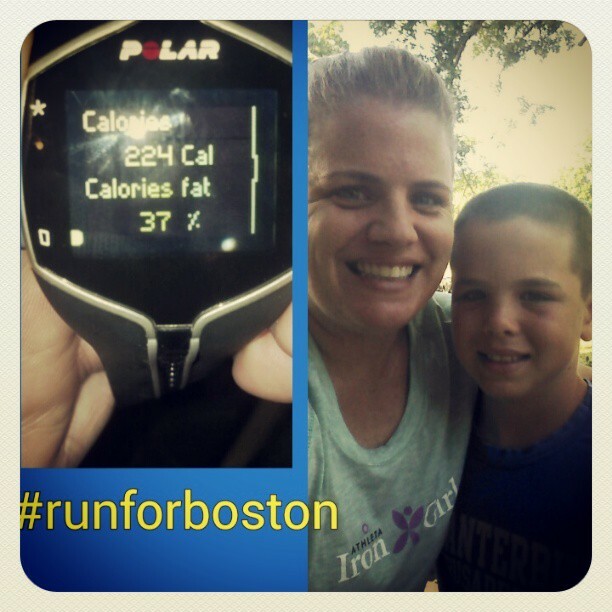 xoxo Prayers for Boston and the running community I am happy they caught those guys!